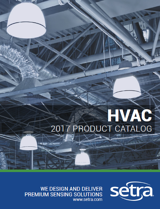 Unidirectional transducers are used in a large variety of HVAC applications such as monitoring static duct pressure; the high port is connected to the point in the duct being monitored. Another example of this would be measuring the differential pressure across a filter to determine whether or not that filter needs to be replaced. In this case, the high port is connected to the inlet side of the filter and the low port is connected to the discharge side. These kind of transducers are used in applications where the direction of flow is known and is not expected to change. If the flow of air reverses, the transducer will be out of range of what it can monitor. The diaphragm of a bidirectional pressure transducer can move in two different directions, enabling the sensor to measure both positive and negative pressure. 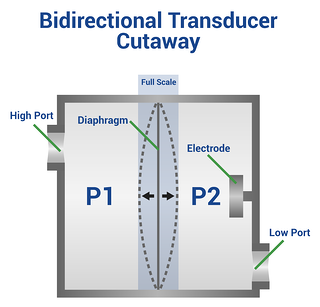 Bidirectional transducers are often used in room pressurization applications. Hospital operating rooms, isolation rooms, pharmacies, vivariums, and other critical environments need to maintain differential pressure in either direction to maintain patient health or otherwise keep an area free of contamination. Positively pressured areas keep outside contaminants out and negatively pressured areas keep inside contaminants in. In either case, during installation the high port of the transducer is always connected to the room being controlled and the low port connected to an outside reference, such as the adjacent corridor. SETRA BLOG: How employees can contaminate a clean environment. NOTE: It is important that the range of the sensor is wide enough for the total amount of pressure the sensor is expected to encounter. It is very important that the sensor is NOT exposed to pressures above its listed range. Setra sensors are rated for their stated ranges and exposing the sensors to excessive overpressure will degrade the accuracy of the unit. Want to learn more? 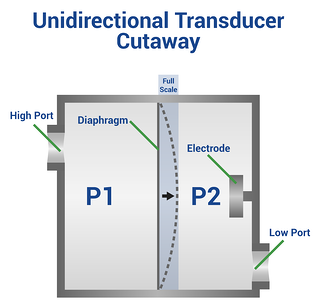 CLICK HERE for help selecting the right kind of differential transducer.